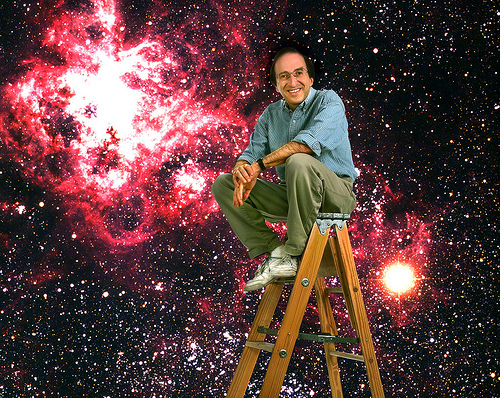 This morning, UC Berkeley physics professor Saul Perlmutter won the Nobel Prize in physics. What what, Berkeley represent! He and his fellow teammates (Brian P. Schmidt and Adam G. Riess) apparently discovered that the universe is being blown apart by a sneaky little force known as “dark energy.” The most likely explanation for this bewildering behavior has something to do with Einstein’s equations that we here at the Clog are not quite sure we understand. All we know is that this dark energy talk has some physicists murmuring about the possibility of multiple universes. Quite a frightening finding indeed, but we’re just excited and proud that one of our own will once again be gracing the stage in Stockholm. Having led the Supernova Cosmology Project here at Berkeley, Dr. Perlmutter will be receiving half of the 10 million Swedish kronor prize money, so do the conversion into dollars yourself, if you want. Or just sit back and be impressed. One more thing to marvel at: Not only is Dr. Perlmutter a fantastic scientist, he’s also a great professor. Students love having him, and enjoy his enthusiastic and energetic style. And after this hefty accomplishment, you can certainly expect the popularity of his classes to shoot up next semester. It even kind of makes us non-sciency Cloggers interested in sitting in on a lecture or two.